Sara Venn is a professional horticulturist, plantswoman, gardener and garden writer. Since 2005 she has made a living from her love of plants, gardens and the natural world. 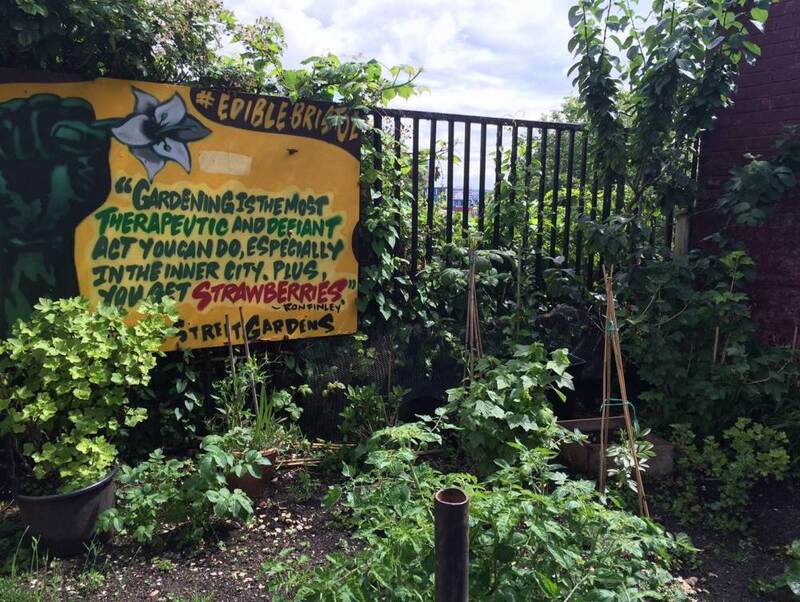 She has also co-founded Incredible Edible Bristol so is busy turning Bristol into the UK’s first edible city! You can follow her on Twitter @saralimback. The question ‘What is a food desert?’ is one I am frequently asked. ‘Surely they don’t exist in the UK?’ is another and so the questions roll, often with the asker looking at me in disbelief when I explain that not only do they exist but that I live in one, in Bristol. People are often very surprised to hear of food deserts in Bristol. With its reputation as a foodie city, and its status in 2015 as European Green Capital, its reputation is somewhat different to its reality. For sure Bristol is full of amazing restaurants and has an abundance of community supported agriculture projects, city farms, and community gardens, but it also has areas where people struggle to access fresh and, most importantly, affordable food for themselves and their families. Where I live, in South Bristol, unless you have a car, which I don’t as I don’t drive, the closest supermarket other than the convenience store at the garage or the corner shop that sells sugary snacks and noodles in pots but not a pint of milk, is over 2 miles away. For sure there are buses, but buses no longer have the place to put your shopping at the front, as it’s been utilised for free newspapers, so it’s really important only to carry onto the bus the amount you can hold within your seat area. For me this is hard. I want a diet full of fresh, locally grown where possible, food that’s good for me. The reality of the supermarkets that are accessible by bus most easily is that they are fairly small stores and their range is limited. A lot of the food isn’t ingredients, but ready meals, pizzas, and their vegetarian options are limited to say the very least! Fizzy pop, crisps, biscuits, pastries, and cakes are given far, far more space than fruit, veg or fresh meat and fish, with all the offers on snacks rather than good food. But of course I have options and choice, and although it means being more organised, I am lucky that I can fairly easily access the Bristol food scene that we all know, and that with an allotment and garden I can grow a lot of our food myself. But what about those people with limited choices, or no choice at all? What about parents juggling jobs, often with unsociable hours, and often more than 2 in order to pay the bills? What about families with no car?What about single parents struggling on one income? All these people are time poor as well as living somewhere that has been designed as a former suburb, with little thought to the logistics of life. Over and again I attend community consultations about food where I hear the clear message that what the community wants is a supermarket. And over and over I see middle class choice not understanding need. For sure community shops, box schemes and deliveries from local suppliers are wonderful but for many they are just not affordable, or what they want. Many of us take for granted the ease of a supermarket, or the expectation of having weekends and evenings free, but for many families this just isn’t the case. I have an understanding of this, as my husband is a prison officer who specialises in mental health and suicide prevention in a hectic women’s prison. He works long hours, and does a job where he can’t just leave when it’s his allotted time. He also works every other weekend. Family life for us has always meant juggling his work commitments around everything else that has to be done. Easy when you live in a small town with two supermarkets and nigh on impossible when you don’t. ‘So what is the answer?’ is a question often asked after the realities of food deserts have settled into people’s understanding. Perhaps what we need as citizens is the will to make things change. As founder and chair of Incredible Edible Bristol, I ask regularly ‘What it is that is needed to make these areas alive again?’. How can we bring fresh, affordable and local food to the people of South Bristol, enabling them to no longer need the out-of-town supermarkets? Look at the effect Incredible Edible has had in Todmorden, its hometown as it were, where local food is now very much a part of everyday life, and with growing going on across the town both in beds on the streets but also at the Incredible Farm and the Incredible Aquagarden. Employment is being brought about by growing food which is then available in local shops, and food has once again become the centre point of conversation for a community. This is what is needed in food deserts and areas of deprivation country wide, with local food growing feeding need rather than choice, ensuring that not only is it fresh and well grown and so wonderfully nutritious, but that it is also affordable and accessible to all. And how do we make this happen? Primarily in my mind, we need to avoid buzz words and fashions in food. Local food is just that; food grown near to the area that it is sold into. It shouldn’t be the latest fashion. It shouldn’t be, dare I say it, seen as something available only to the middle classes, those who can afford to make choices about where they buy their food, but available to all. But more than that we need to reconnect people with the land, and with from the origins of food sources, enabling and empowering communities to come together to grow and prepare some of their own food, preserve their gluts in community kitchens and create a local food economy which sees job creation and skill sharing and learning, allowing people choice whilst supporting them in creating better environments and lives for themselves and their children. At Incredible Edible Bristol we are doing this by working with communities and volunteers to create beautiful and productive food growing gardens across the city, where people are welcome to come along and help us grow the food, learning those vital skills and taking them back to their own neighbourhoods to share with friends and neighbours and quietly take back some control. We like to think of it as a Revolution of Kindness and you are all very welcome to join! This story is part of our month celebrating ‘The power of food’. You can join us using #FoodPower on Facebook and Twitter. Employment is being brought about by growing food which is then available in local shops, and food has once again become the centre point of conversation for a community.